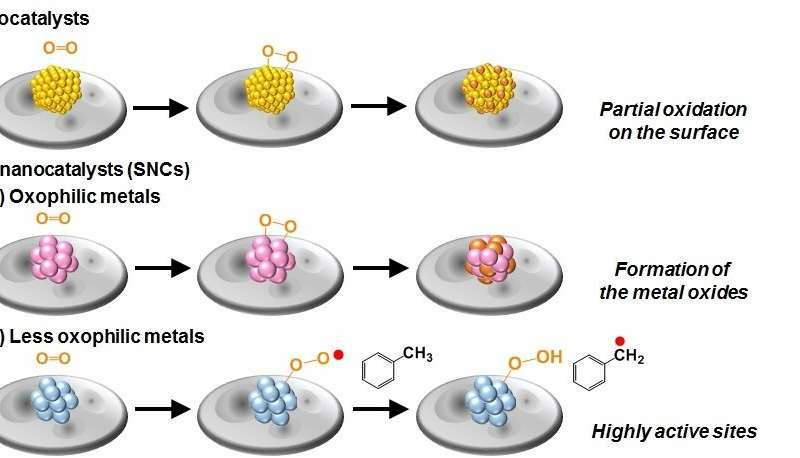 Scientists at Tokyo Institute of Technology produced subnano-sized metallic particles that are as much as 50 times more effective than well-known Au-Pd bimetallic nanocatalysts. The oxidation of aromatic hydrocarbons is critically important for producing a great variety of useful organic compounds. These oxidation processes require the use of catalysts and solvents, which are usually environmentally hazardous. Thus, finding a solvent-free oxidation process using nanosized catalytic particles has attracted considerable attention. Interestingly, sub-nanoscale catalytic particles (subnanocatalysts, or SNCs) composed of noble metals are even better at their job because their increased surface area and unique electronic state results in favorable effects for oxidizing hydrocarbons and also prevents them from getting oxidized themselves. This makes them cost-effective because the amount of metal required for SNCs is lower than for nano-sized catalysts. A team including Dr. Miftakhul Huda, Keigo Minamisawa, Dr. Takamasa Tsukamoto, and Dr. Makoto Tanabe at Tokyo Institute of Technology (Tokyo Tech), led by Prof. Kimihisa Yamamoto, created multiple types of SNCs by using dendrimers, which are tree-like spherical molecules that can be used as a template to contain the desired catalysts. 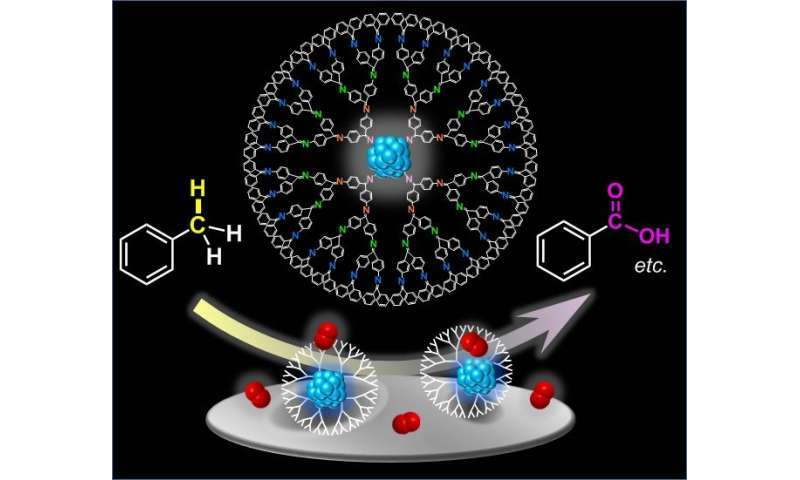 "Dendrimers are expected to provide internal nanospaces that could be suitable for catalytic conversion in the presence of metal particles," explains Yamamoto . The team created catalysts of different sizes, depending on the noble metal used and the number of atoms of each catalytic particle. They compared their performance to find the best noble metal for making SNCs and then explored the mechanism behind their high catalytic activity. Smaller SNCs were found to be better, while less oxophilic metals (such as platinum) were superior. The team postulated that the surface of platinum SNCs does not oxidize easily, which makes them reusable. 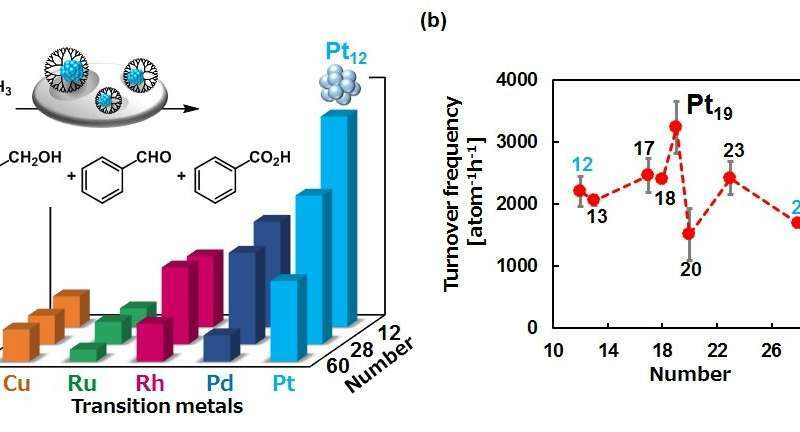 Pt19 SNC showed catalytic performance as high as 50 times more effective than the common Au-Pd nanocatalysts. The team will continue working to shed light on these catalytic phenomena. "The development of a more detailed mechanism including theoretical considerations is currently in progress," says Tanabe. The applications of such catalysts could greatly contribute for reducing pollution and enhancing our effective use of Earth's metal resources.